New York Sen. Kirsten Gillibrand became the latest Democratic 2020 presidential hopeful to back the Green New Deal being pushed by environmentalists and the left-most wing of her party. “Senator Gillibrand supports the Green New Deal concept and has been working for years on policies to aggressively combat climate change, protect our environment and create a green economy in communities that have often been left behind,” Gillibrand spokeswoman Whitney Brennan told Axios Tuesday. For Gillibrand, who recently created a presidential exploratory committee, endorsing the Green New Deal is an easy move since no firm policies have been proposed. Instead, the plan aims to achieve broad goals, including a 100-percent green energy economy and a slew of welfare programs. A draft of Green New Deal legislation was put together over a single weekend by millennial environmental activists and staffers for Democratic New York Rep. Alexandria Ocasio-Cortez, the deal’s biggest champion. “And your biggest issue is, your biggest issue is how are we going to pay for it? — and like this is the war, this is our World War II,” Ocasio-Cortez said Monday at a Martin Luther King Day event in New York City. U.S. 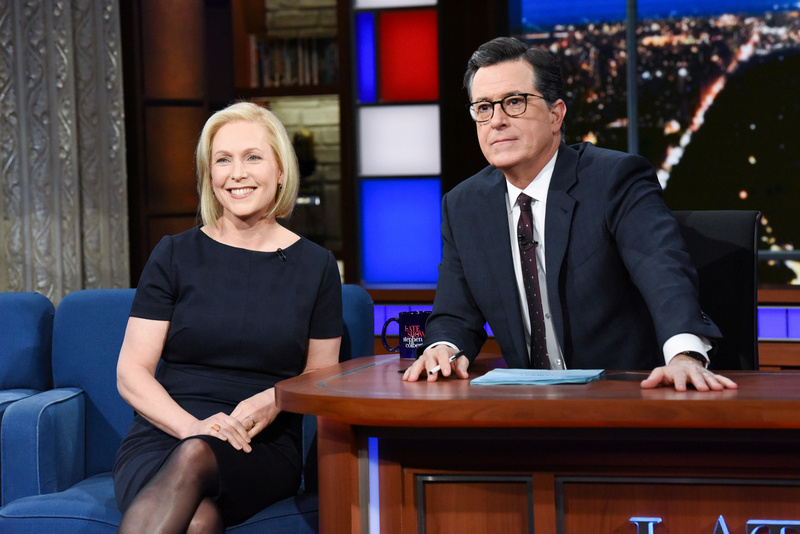 Senator Kirsten Gillibrand (D-NY) makes an appearance on the Late Show with Stephen Colbert in New York, NY, U.S., January 15, 2019. Courtesy Scott Kowalchyk/CBS/Handout via REUTERS. Gillibrand is only the latest 2020 hopeful to endorse Ocasio-Cortez’s plan. Democratic California Sen. Kamala Harris, who announced she will run for president Monday, “supports the goals” of the Green New Deal, according to a spokesperson. Sens. Cory Booker of New Jersey and Bernie Sanders of Vermont also back the Green New Deal, as do a growing number of Democratic lawmakers. However, while many Democrats support the Green New Deal, House Democratic leadership has not embraced the plan.